Today’s stage includes six classified climbs, with the first of those starting after 55 kilometres. The Category 4 climb of the Cote de Capvern is up first, averaging 3.1 per cent for 7.7 kilometres. It will be a nice way to start a long day of climbing. Michael Matthews will be hoping Marcel Kittel has already been dropped from the peloton, as the intermediate sprint point comes after 90 kilometres. It is more than likely that Matthews will get himself into the break, as he has done previously in this race, to take maximum points at the intermediate. The Category 2 climb of the Col des Ares is the second categorised climb, which is another easy climb gradient-wise, at only 4.6 per cent for 7.4 kilometres. It is then a short descent before the first-category climb of the Col de Mente, which averages 8.1 per cent for just under seven kilometres. The decent has a series of switchbacks in the first few kilometres, then it’s a fairly flowing affair before the peloton start the most difficult climb of the route, the hors category climb of the Port de Bales. The climb averages just under eight per cent for 11.7 kilometres, however has gradients of above 19 per cent. At the top of the climb, the riders will be just over 30 kilometres to the finish, with the descent to the penultimate climb leading the riders into the final 15 kilometres. The penultimate climb of the Col de Peyresourde will offer a chance for the general classification men to attack, with the climb being just under 10 kilometres at 7.6 per cents, with gradients at 12 per cent. The climb is completed with five kilometres to go, with the riders then descending along straight roads until the 2.5 kilometre to go point, where they start the final climb, to the finishing point at the top of the Peyragudes. The final climb is 2.5 kilometres at 8.1 per cent, with a maximum gradient at 14.1 per cent. The opportunists who are looking for the King of the Mountains jersey will need to be in the break today, with a lot of points on offer. The final 50 kilometres are identical to those raced over back on Stage 17 of the 2012 Tour. On that day, Alejandro Valverde took the stage, ahead of Chris Froome. 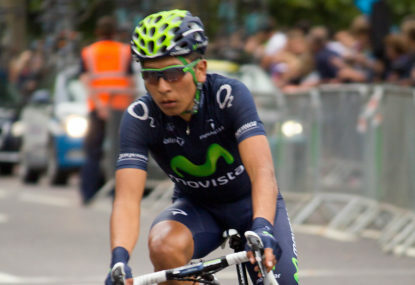 Can Nairo Quintana emulate his teammate and win atop the Peyragudes? Join The Roar’s live coverage of Stage 12 of the Tour de France from 9pm (AEST).